Sometimes there’s no alternative to the cliché of ‘best-kept secret’. 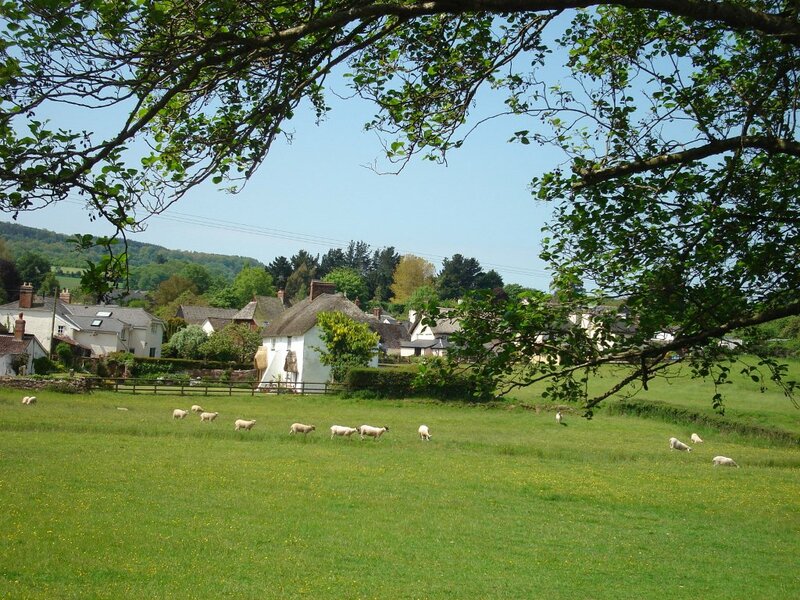 How did Devon manage to keep this place to itself for so long when I have been committed to finding its hidden gems for Slow Devon and for a recent article in Which? Travel Magazine. How does one uncover these secrets anyway? That’s the job of guidebook researchers, and sometimes the tiniest thread of information leads to a dollop of serendipity, as it did today. My co-author Janice Booth and I have just started working on Slow South Devon and Dartmoor. A lovely job, specially on a perfect June day when the bluebells are still in bloom and the beech leaves have that iridescent glow that only lasts for a couple of weeks in late spring. 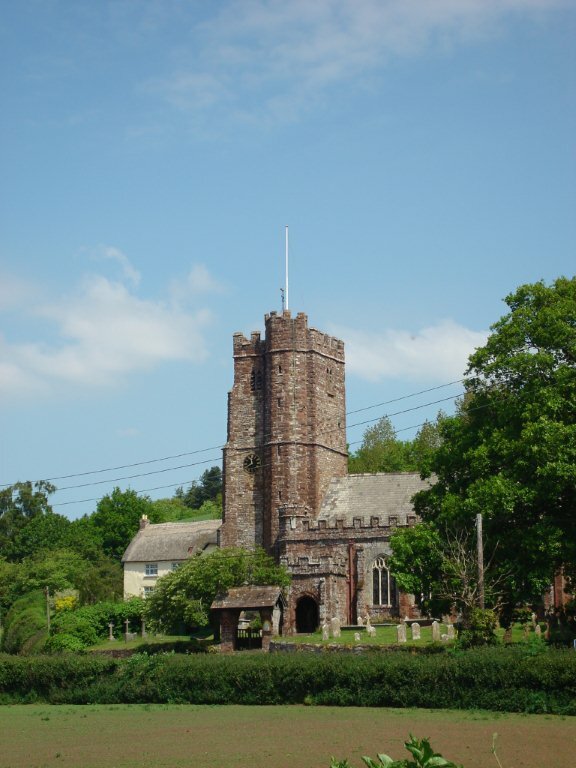 We love old churches, and Janice had spotted an entry in The Pilgrim’s guide to Devon’s Churches which sounded quite appealing. It was in ‘the picturesque Kenn valley’ and as an additional attraction its yew tree was ‘in excess of 1500 years of age.’ We were heading for Teignmouth and although we couldn’t locate Kenn on the map, we reckoned it wouldn’t be much of a diversion and that our SatNav, Lydia, would find it. She did — and what a find! 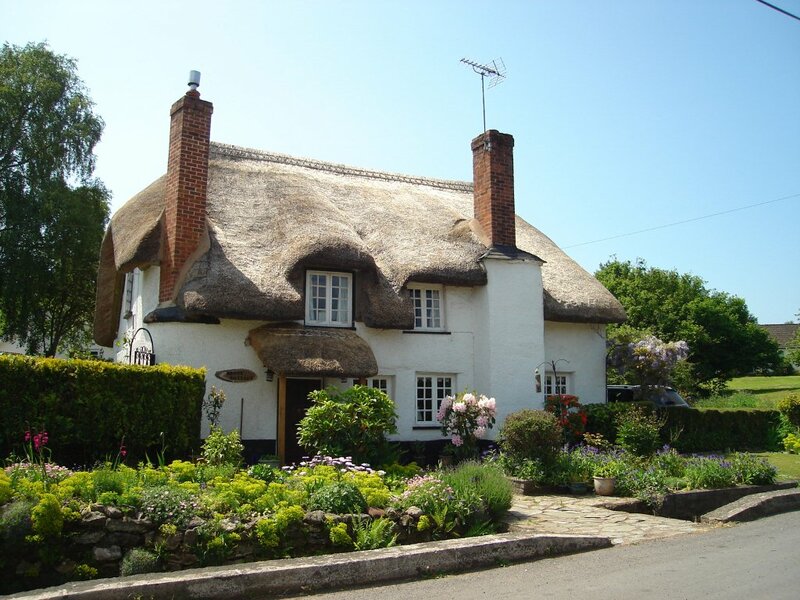 Only five miles from Exeter, and perhaps a mile from the dual carriageway leading south, we turned down a little country lane flanked with banks smothered in wild flowers to find a perfect Devon village. And I mean perfect. A little brook runs past thatched cottages, a chestnut tree splashed with red ‘candles’ stands in a grassy circle between the thatched pub, The Ley Arms, and the red sandstone church. An illustrated board by the graveyard points out the flora and fauna found there, and the yew tree is utterly splendid. Huge, cathedral-like with its pillars of surviving trunk around a hollow centre. The church smells right – and that’s important – that indescribable scent of old oak, flowers and mildew that defines our country churches. And it has a most beautiful screen. Lavishly carved, with leaves and saints and holinesses. It’s old, 16th century, and somehow escaped the ravages of the Reformation. Maybe Henry’s men were no better at finding Kenn than we were. Painted saints fill the niches in the lower part of the screen, demurely separated into men and women, and what I loved most of all is that St Jerome’s lion is wearing a halo! The pub is under new management and full of bustle; men came and went with pots of whitewash as we sat in the sunny beer garden drinking coffee. Too early for lunch but the menu looked appealing. Later, as we wandered down the road, we came upon The Library. 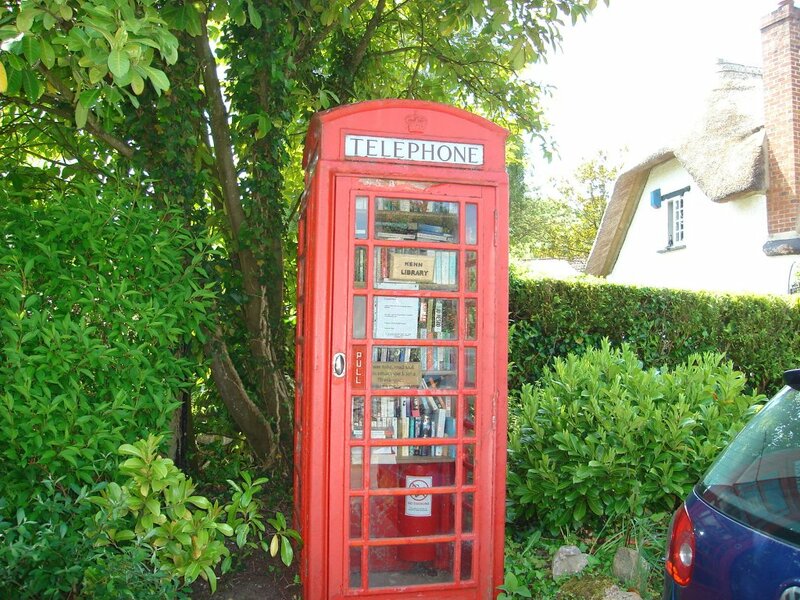 In a phone box! That, somehow, summed up the character of this enchanting village. My book Dingle Peggy will be published next month, a sequel to Connemara Mollie. It’s taken 30 years of hindsight to make me appreciate just how much I owe these ponies. 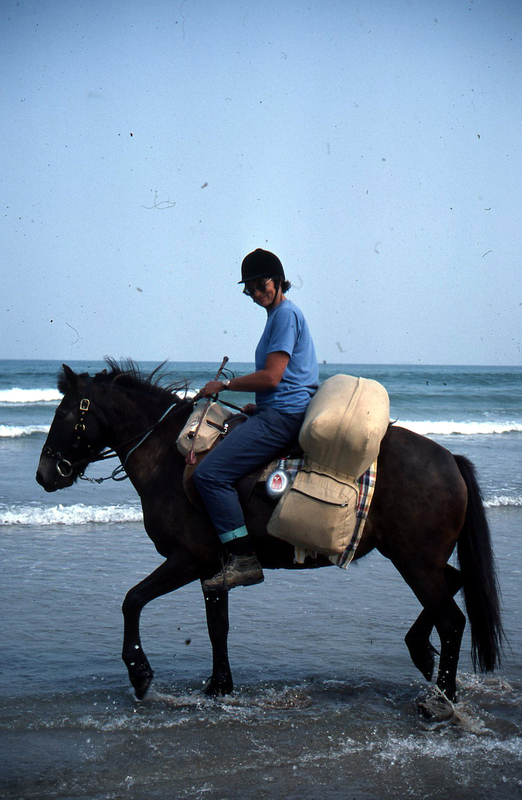 When I started the trek, with Mollie, I was still in the mindset that the most important part of horse management was control. Was the pony obedient? Could I make it do what I wanted? By the end of the trek I had learned that it was as important for me to understand what the pony was trying to tell me as it was to impose my will on the animal. Mollie was a calmer, more phlegmatic personality, so it was Peggy who was the catalyst in that transition. As I’d remarked when I first had her, I’d never known such an extrovert, sociable horse. Communication was her thing, so communicating with me came naturally. I am ashamed now at how slow I was to learn that any strange behaviour was her attempt to tell me something, rather than sheer naughtiness. Horses are perhaps unique in our animal-doting world. We love them, we try to bond with them, and then we sell them on. A talented horse will have several owners during its 30-year lifetime, and goodness knows how many riders. Each time it changes hands it is expected to make the adjustment and respond with generosity. Most horses do. That is an extraordinary and deeply touching fact. My thousand miles through Ireland changed me forever. I learned how to cope alone with triumph and disaster, how to enjoy my solitary state and to live in the present as time slipped by. I learned about generosity, and about the old, old human attribute of hospitality to strangers. I learned about the history of Ireland and the uncomfortable fact of my country’s oppression, and I learned that this is one of the most beautiful places in Europe. But above all I treasure that opportunity to get to know, and be friends with, Mollie and Peggy. Where in this wide world can man find nobility without pride, friendship without envy, or beauty without vanity? Here where grace is laced with muscle, and strength by gentleness confined. He serves without servility; he has fought without enmity. There is nothing so powerful, nothing less violent, there is nothing so quick, nothing more patient. England’s past has been borne on his back. All our history is his industry; we are his heirs, he our inheritance. Ladies and gentlemen: the horse. 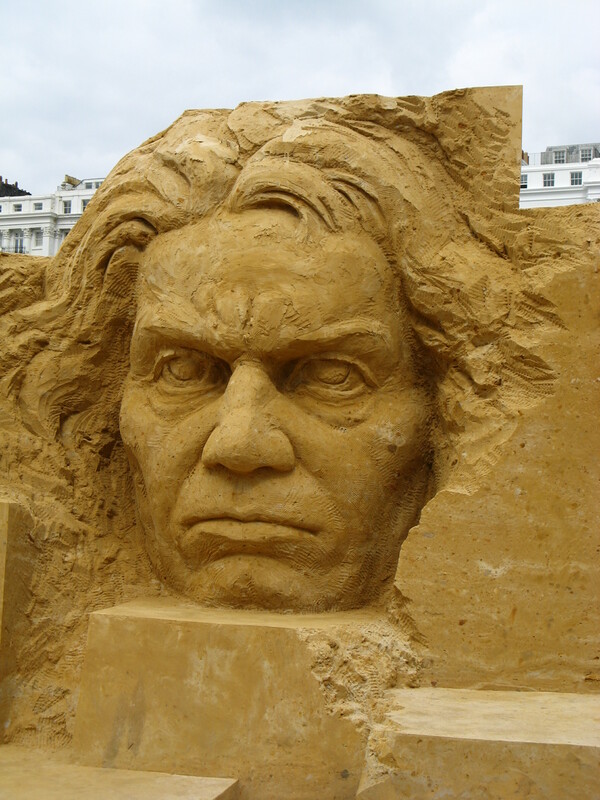 Earlier this month I spent a weekend in Brighton learning about sand sculpture. Now this is something I have never even seen close up, only photos, and as a sculptor myself I couldn’t imagine how they were done. Now I know, and I’ve had a go myself and can say authoritatively that as sculpture material goes, sand is not at all bad. But first, if you live anywhere near Brighton, go and take a look yourself. 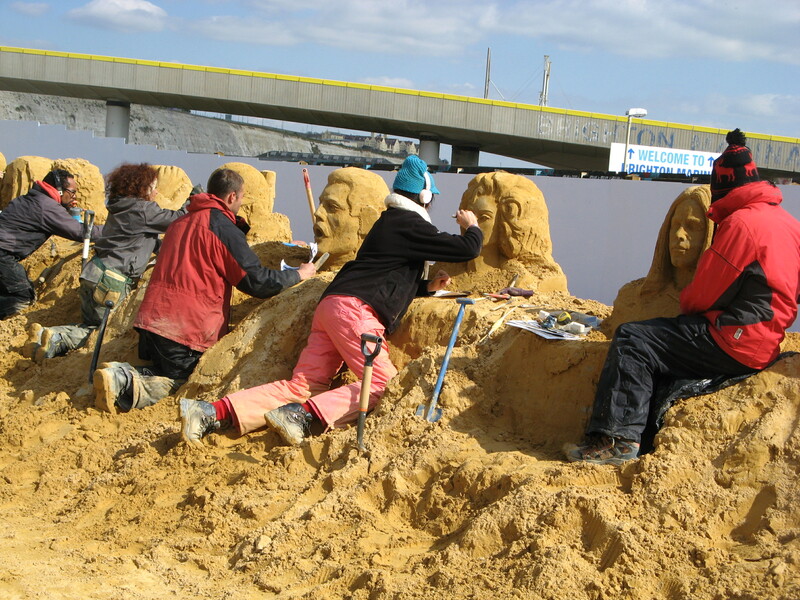 This is actually the first ‘proper’ sand sculpture festival they’ve had. By proper I think I mean where there’s a theme and professional sculptors from all over the world for an intense week of creativity and then head home, leaving a couple of repairers on site in case the odd nose falls off.The festival is organised by Nicola Wood. It’s what she does – so much so that she’s given up her house since she’s always on the move creating these festivals in different parts of the world. 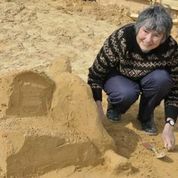 She sources the sand (in this case from Redhill since Brighton hasn’t got any sand), finding the right stuff that bonds together properly, decides on the theme, employs the sculptors, teach would-be sculptors like myself, and generally ensures that the festival runs smoothly until the whole lot are bulldozed in September. First the sand has to be compacted so that it’s almost as hard as sandstone. 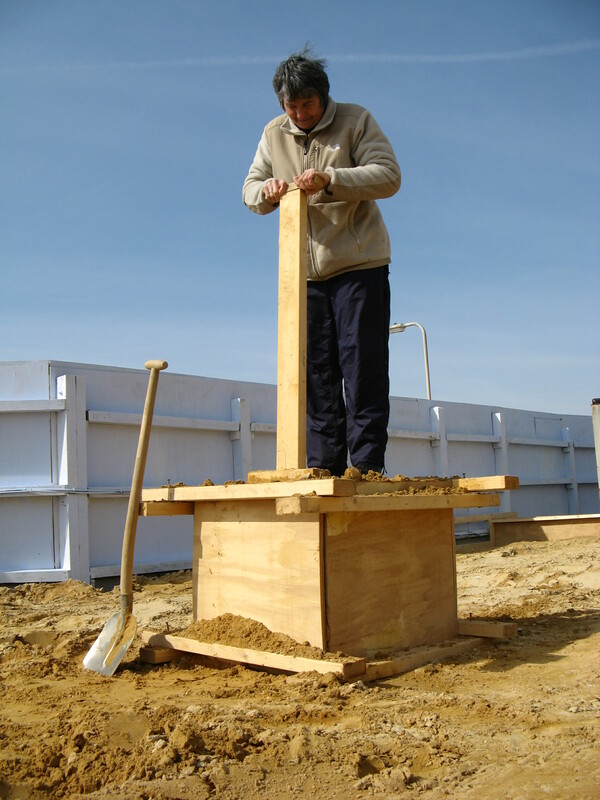 Wooden planks form a removable frame, sand is added gradually, mixed with water, and compressed using a mechanical trench-rammer. More frames are added, building the block into a pyramid shape. For my small-scale sculpture I just jumped on the sand in the frame and banged at it with a wooden block. Part of Nicola’s job was to find out beforehand which musician the sculptors wanted to do and provide photos so they could get a likeness. And do they ever! The portrait of Beethoven was utterly wonderful, I thought. My favourite of the whole show, but then I know what Beethoven looks like, whereas most of the pop musicians remained a mystery to me even after I was told their names. Still, Bob Marley was certainly recognisable by his dreadlocks, and Elvis with flairs. 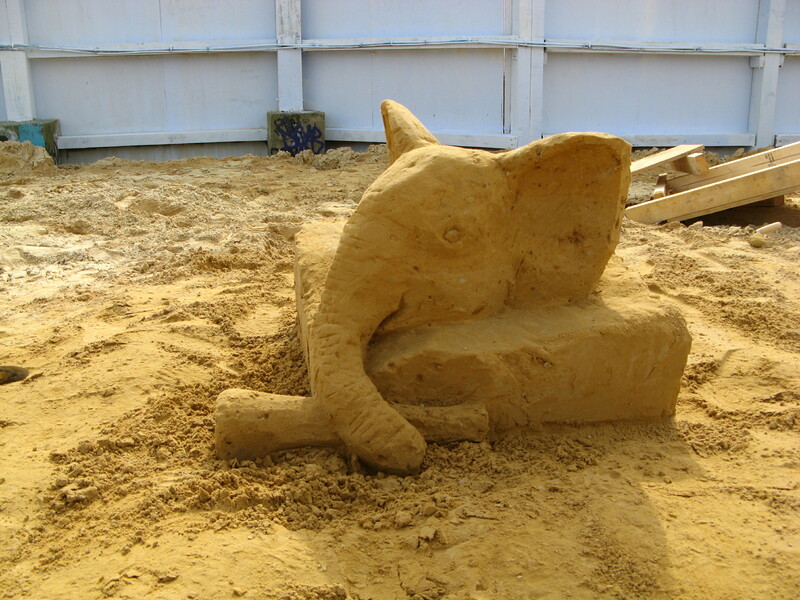 Because sand is soft, tools can be anything the sculptor chooses. You don’t need chisels. Almost everyone worked with a plastering tool and anything else that they fancied such as palette knives, spoons and so on. I’d given a bit of thought as to what I would carve. I didn’t want to do a portrait because I’m rubbish at people, though I did consider doing Leonard Cohen since I reckoned he should be there. I sculpt animals, so I thought that “Elephant blowing its own trumpet” would be doable and in keeping with the music theme. It went fine until the trunk and trumpet fell off. So the finished sculpture is “Elephant about to blow its own trumpet” in an altogether less ambitious pose. Our house was overrun with mice when I was a child. It was my fault. Even though I learned at a tender age how to tell males from females, I never anticipated the onset of puberty in my pet mice early enough. So at one time I had 49 mice in a variety of different cages and at interval loose in the house when they escaped. With a noble sober mouse. To lend comfort to its house. Well, I’ve changed. I now have mice, and maybe rats, and they are demolishing my house bit by bit while I look on helplessly. Two disappeared loaves of bread (yes, my fault leaving them out). An Everest-sized pile of carpet nibblings and a non-fitted sitting room carpet. But no first editions – yet – so perhaps I’m lucky. Or these rodents aren’t guide-book readers. Mouse traps are ignored, they tap-dance to the sonic mouse repeller, and I’m at my wits end. PROSOPAGNOSIA or who on earth are you? I have a T-shirt, given to me by a colleague, which says: “I’M PROSOPAGNOSIC. WHO ARE YOU?” An article in The Times by Mary-Ann Sieghart in 2006 had finally given a name to a condition that I’d suffered from all my life, but assumed, like other people with prosopagnosia, or face blindness, that my inability to recognise people — even, on occasion, friends and family – was just a sign of social ineptness. For someone with face blindness, I couldn’t have chosen a worse profession. Or professions. As a publisher attending (oh, the nightmare) Frankfurt Book Fair, I would have to cope with a steady flow of unrecognisable faces, their name-badges hidden or absent, or so low-down that I had to perform a sort of curtsy to see them, who would want to talk business. I wanted to talk business too – that was why I was there – but who the hell were they? How long could I bluff my way through the conversation waiting for a clue to their identity? Janet, the ever-obliging colleague who gave me the T-shirt, was primed to whisper their name as they approached but didn’t always have the opportunity . Then there were the publishing events where I’d fail to recognise our authors, or travel fairs where Bradt’s most loyal fans said sadly “Well I expect you meet so many people” when my face didn’t light up at their approach. If publishing events were bad, tour leading was dreadful. I’m not sure, looking back, which was worse: the meet and greet at the airport or breakfast the next morning. At the airport I would identify the members of my group and ask them to wait together while I assisted with luggage or met the last stragglers. Then I had no idea which of those little groups of foreigners were mine. But I think, on reflection, that breakfast the first morning was worse. How was I to recognise the group, all sitting at separate tables? Different clothes, washed hair. It was hopeless. Perversely, however, I have my prosopagnosia to thank for my biggest break-through into writing. 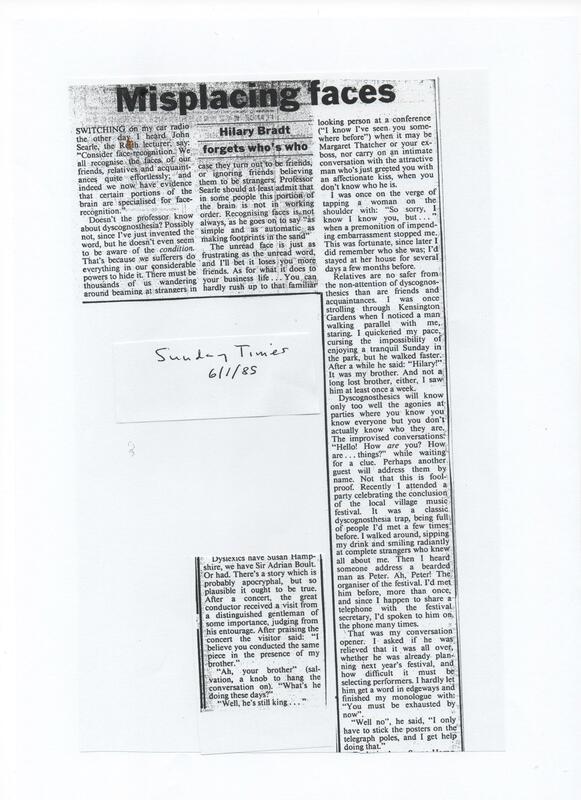 More than 20 years before that Times article that broke the news that I wasn’t alone, I was incensed to hear a scientist on Radio 4 say that “recognising faces is as simple and automatic as making footprints in the sand.” I dashed off a short article on the subject to the Sunday Times, inventing the name Dyscognosthesia for my condition. A couple of days later I had a phone call from the editor saying she found it “very funny” and would like to publish it that weekend. I felt that I’d arrived. Working on two very different projects, writing and sculpture, it’s occurred to me how similar the process actually is – at least for me. Both involve a significant amount of procrastination followed by some very happy productivity. The sculpture was only delayed for four years, which is pretty good for me. 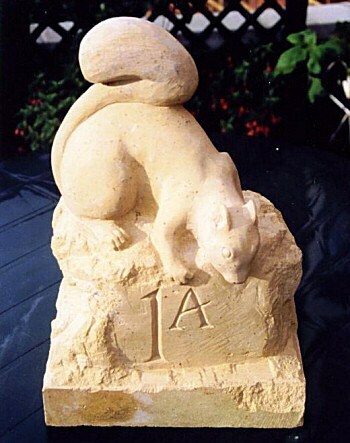 When I lived at 1A Hoo Cottage I carved a squirrel/house number for my driveway. 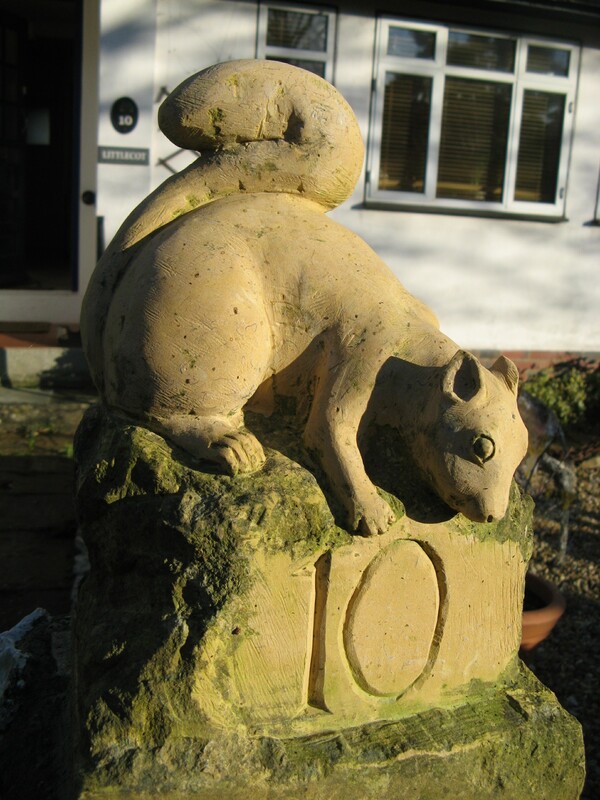 When I moved to number 10 in Seaton I had a stone wall built and specified a plinth-like gate post for the adapted squirrel. It wouldn’t take me a moment, I thought, to change the A to an 0. The squirrel stood outside my office window on my stone-carving bench under a tarpaulin. And I did nothing. Each summer I removed the tarpaulin so I could see it every day – and still did nothing. What was revealed was that the squirrel, which I thought was finished and beautiful, was not right. Its eyes lacked prominence and the tail was too bushy, even for a grey. So although the basic shape was correct the detail wasn’t. I can only carve outside, in fine weather, but suitable days passed and no carving. There was always something more urgently needing my attention in the garden. But I’ve learned that it’s no good planning for a long-neglected task, the enthusiasm to do it has to ambush me so that suddenly there is nothing else I want to do more. So it was with the squirrel, which is now mounted on my wall end. On a fine autumn day I found myself getting out my chisels and rasp and working with enthusiasm over the next few days until I was happy with the result. Revising Connemara Mollie and now Dingle Peggy has taken me 27 years, but the insidious process has been the same though I had more excuses. First I lost the manuscript, and when I was reunited with it and read it through I realised that, like the squirrel, although the shape was OK it was unfinished. It needed a thorough revision. Then the thought of retyping the original pencil manuscript put me off for a decade or two. So I paid someone to do it for me. No more excuses, but I manufactured them until the ambush came and I started the revising Peggy at the beginning of this month. At first sluggishly, with no inner feeling of creativity, but as the effect that I wanted emerged from the page I’ve worked with increased enthusiasm and now it’s all I want to do each day. So just like the squirrel, I’m cutting away all the unnecessary stuff and working on the detail. I hope I’ll end up with the Real Thing. It’s the same creative process. Remember the Good Old Days when show jumping was one of the most popular sports on TV? How many other elderly ladies, I wonder, remember fondly those black-and-white scenes when Pat Smythe and Tosca thrilled us at the Royal International Horse Show and the Horse of the Year Show. With the help of commentator Dorian Williams, we knew as much about the horses and riders as we did our own families. I was 11 when the 1952 Olympic Games were held in Helsinki. Ponyless, passionate about riding, and devouring every word of Pony and Riding magazines, I immersed myself in the story of Colonel Llewellyn and Foxhunter and how he won us our only gold medal (in the team show jumping) that year. On the last day, I believe. 1956, I remember, was a strange Olympics since the equestrian events were held in Stockholm while the main Games were in Australia. Pat Smythe rode in that one (Flanagan), and Wilf White on Nizefella who delighted audiences with his extravagant kick-back as he cleared each fence. But the horse I remember best is Halla, who won the gold medal for Germany. I know more about Halla and Hans Günter Winkler than the bronze-medal winners from Britain because I went to stay with my German pen friend the following year and her mother gave me Winkler’s book Meine Pferde und Ich. I then learnedjust what an achievement that gold medal had been. Winkler pulled a muscle in the first round and in the all-important second round could only steer Halla round the course, screaming with pain at each jump. The mare jumped a perfect clear round. 1960 and Rome was memorable for Sunsalve. Did he or didn’t he have a foot in the water? My horse magazines kept up the discussion for weeks. In those days, I think, there was just a tape at the edge of the water jump, not plastecine, and judging was done by eye. We so wanted David Broome to have ridden him to a clear. He was a crazy horse, head held irresponsibly high and always seeming on the verge of running away, but a brilliant jumper. The d’Inzeo brothers won gold and silver (remember that beautiful grey, The Rock? ); David got the bronze. I remember nothing about 1964 (although records show that Peter Robeson won the bronze medal on Firecrest) but 1968 was something else — I was there! Not only did I go to Mexico for the Olympic Games but I had a ticket for the eventing, where the British team won a gold medal in torrential rain. But I hadn’t been successful in getting a ticket for show jumping and was desperate. I went to the stadium and somehow managed to talk my way in (or to be accurate, a Spanish-speaking friend did the talking – I just hovered). We got in, ticketless, and sat down in the best seats in the arena. A posh English group advanced on ‘our’ seats and said: ‘Oh, I thought we were sitting there. Never mind, we’ll take these ones.’ It’s one of the wickedest – and best – things I’ve done in my life. Because this was the year that a pony competed in the top test of show jumping in the world – and won a silver medal! Stroller was only 14.2hh. Think about it – that’s literally a pony and a good hand smaller than horses considered tiny in these days of massive stallions. I get quite teary thinking about it even now, remembering how tiny Stroller looked behind those enormous jumps, and the skill with which Marion Coakes got him round. Silver is not gold, but what an achievement! And David Broome on Mr Softee got bronze. Until this year no other Olympic equestrian event lived up to that day in Mexico. How lucky I was to be there, and how wonderful in London to see the British team back in the realm of gold.